Mohammed Amin al-Husseini (Arabic: محمد أمين الحسيني‎‎; c. 1897 – 4 July 1974) was a Palestinian Arab nationalist and Muslim leader in Mandatory Palestine. Al-Husseini was the scion of a family of Jerusalemite notables, who trace their origins to the eponymous grandson of Muhammad. After receiving an education in Islamic, Ottoman and Catholic schools, he went on to serve in the Ottoman army in World War I. At war's end he stationed himself in Damascus as a supporter of the Arab Kingdom of Syria. Following the fiasco of the Franco-Syrian War and the collapse of Arab Hashemite rule in Damascus, his early position on pan-Arabism shifted to a form of local nationalism for Palestinian Arabs and he moved back to Jerusalem. From as early as 1920 he actively opposed Zionism, and was implicated as a leader of the 1920 Nebi Musa riots. Al-Husseini was sentenced to ten years' imprisonment but was pardoned by the British. 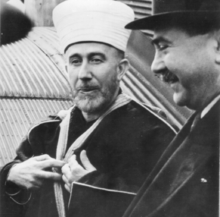 In 1921 the British High Commissioner appointed him Grand Mufti of Jerusalem, a position he used to promote Islam while rallying a non-confessional Arab nationalism against Zionism. During the period 1921-36 he was considered an important ally by the British Mandatory authorities. His opposition to the British peaked during the 1936–39 Arab revolt in Palestine. In 1937, evading an arrest warrant, he fled Palestine and took refuge successively in the French Mandate of Lebanon and the Kingdom of Iraq, until he established himself in Fascist Italy and Nazi Germany. During World War II he collaborated with both Italy and Germany by making propagandistic radio broadcasts and by helping the Nazis recruit Bosnian Muslims for the Waffen-SS (on the ground that they shared four principles: family, order, the leader and faith). Also, as he told the recruits, Germany had not colonized any Arab country while Russia and England had. On meeting Adolf Hitler he requested backing for Arab independence and support in opposing the establishment in Palestine of a Jewish national home. At the war's end he came under French protection, and then sought refuge in Cairo to avoid prosecution. In the lead-up to the 1948 Palestine war, Husseini opposed both the 1947 UN Partition Plan and King Abdullah's designs to annex the Arab part of British Mandatory Palestine to Jordan, and, failing to gain command of the 'Arab rescue army' (jaysh al-inqadh al-'arabi) formed under the aegis of the Arab League, formed his own militia, al-jihad al-muqaddas. In September 1948 he participated in the establishment of an All-Palestine Government. Seated in Egyptian-ruled Gaza, this government won limited recognition by Arab states but was eventually dissolved by Egyptian president Gamal Abdel Nasser in 1959. After the war and subsequent Palestinian exodus, his claims to leadership were wholly discredited and he was eventually sidelined by the Palestine Liberation Organization, losing most of his residual political influence. He died in Beirut, Lebanon in July 1974. Husseini was and remains a highly controversial figure. Historians dispute whether his fierce opposition to Zionism was grounded in nationalism or antisemitism or a combination of both. 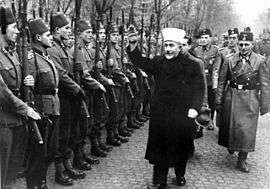 Opponents of Palestinian nationalism have used Husseini's wartime residence and propaganda activities in Nazi Germany to associate the Palestinian national movement with European-style anti-Semitism. Amin al-Husseini was born around 1897 in Jerusalem, the son of the mufti of that city and prominent early opponent of Zionism, Tahir al-Husayni. The al-Husseini clan consisted of wealthy landowners in southern Palestine, centered around the district of Jerusalem. Thirteen members of the clan had been Mayors of Jerusalem between 1864 and 1920. Another member of the clan and Amin's half-brother, Kamil al-Husayni, also served as Mufti of Jerusalem. In Jerusalem Amin al-Husseini attended a Qur'an school (kuttub), and Ottoman government secondary school (rüshidiyye) where he learnt Turkish, and a Catholic secondary school run by French missionaries, the Catholic Frères, where he learnt French. He also studied at the Alliance Israélite Universelle with its non-Zionist Jewish director Albert Antébi. In 1912 he studied Islamic law briefly at Al-Azhar University in Cairo and at the Dar al-Da'wa wa-l-Irshad, under Rashid Rida, a salafi intellectual, who was to remain Amin's mentor till his death in 1935. Though groomed to hold religious office from youth, his education was typical of the Ottoman effendi at the time, and he only donned a religious turban in 1921 after being appointed mufti. Until late 1920, al-Husseini focused his efforts on Pan-Arabism and the ideology of the Greater Syria in particular, with Palestine understood as a southern province of an Arab state, whose capital was to be established in Damascus. Greater Syria was to include territory of the entire Levant, now occupied by Syria, Lebanon, Jordan, Palestinian Authority and Israel. The struggle for Greater Syria collapsed after France defeated the Arab forces in Battle of Maysalun in July 1920. The French army entered Damascus at that time, overthrew King Faisal and put an end to the project of a Greater Syria, put under the French Mandate in accordance with the prior Sykes-Picot Agreement. Palestinian notables responded to the disaster by a series of resolutions at the 1921 Haifa conference, which set down a Palestinian framework and passed over in silence the earlier idea of a south confederated with Syria. This framework set the tone of Palestinian nationalism for the ensuing decades. Al-Husseini, like many of his class and period, then turned from Damascus-oriented Pan-Arabism to a specifically Palestinian ideology, centered on Jerusalem, which sought to block Jewish immigration to Mandatory Palestine. The frustration of pan-Arab aspirations lent an Islamic colour to the struggle for independence, and increasing resort to the idea of restoring the land to Dar al-Islam. From his election as Mufti until 1923, al-Husseini exercised total control over the secret society, Al-Fida’iyya (The Self-Sacrificers), which, together with al-Ikha’ wal-‘Afaf (Brotherhood and Purity), played an important role in clandestine anti-British and anti-Zionist activities, and, via members in the gendarmerie, had engaged in riotous activities as early as April 1920. On 10 August 1928, a constituent assembly convened by the French in Syria was rapidly adjourned when calls were made for a reunification with Palestine. Al-Husseini and Awni Abd al-Hadi met with the Syrian nationalists and they made a joint proclamation for a unified monarchical state under a son of Ibn Sa'ud. On the 26th. the completion of the first stage of restoration work on the Haram's mosques was celebrated with great pomp, in the presence of representatives from the Muslim countries which had financed the project, the Mandatory authorities, and Abdullah, Emir of Transjordan. A month later, an article appeared in the Jewish press proposing the purchase and destruction of houses in the Moroccan quarter bordering on the wall to improve pilgrim access and thereby further the 'Redemption of Israel.' Soon after, on 23 September, Yom Kippur, a Jewish beadle introduced a screen to separate male and female worshippers at the Wall. Informed by residents in the neighbouring Mughrabi quarter, the waqf authority complained to Harry Luke, acting Chief Secretary to the Government of Palestine, that this virtually changed the lane into a synagogue, and violated the status quo, as had the collapsible seats in 1926. British constables, encountering a refusal, used force to remove the screen, and a jostling clash ensued between worshippers and police. Zionist allegations that disproportionate force had been employed during what was a solemn occasion of prayer created an outcry throughout the diaspora. Worldwide Jewish protests remonstrated with Britain for the violence exercised at the Wall. The Jewish National Council Vaad Leumi ‘demanded that British administration expropriate the wall for the Jews’. In reply, the Muslims organized a Defence Committee for the Protection of the Noble Buraq, and huge crowd rallies took place on the Al-Aqsa plaza in protest. Work, often noisy, was immediately undertaken on a mosque above the Jewish prayer site. Disturbances such as opening a passage for donkeys to pass through the area, angered worshippers. After intense negotiations, the Zionist organisation denied any intent to take over the whole Haram Ash-Sharif, but demanded the government expropriate and raze the Moroccan quarter. A law of 1924 allowed the British authorities to expropriate property, and fear of this in turn greatly agitated the Muslim community, though the laws of donation of the waqf explicitly disallowed any such alienation. After lengthy deliberation, a White Paper was made public on 11 December 1928 in favour of the status quo. On 1933, According to Alami, The mufti expressed interest in Ben Gurion's proposal of a Jewish-Palestine as part of a larger Arab federation. In July 1937, British police were sent to arrest al-Husseini for his part in the Arab rebellion, but, tipped off, he managed to escape to the sanctuary of asylum in the Haram. He stayed there for three months, directing the revolt from within. Four days after the assassination of the Acting District Commissioner for that area Lewis Yelland Andrews by Galilean members of the al-Qassam group on 26 September, al-Husseini was deposed from the presidency of the Muslim Supreme Council, the Arab Higher Committee was declared illegal, and warrants for the arrest of its leaders were issued, as being at least 'morally responsible', though no proofs existed for their complicity. Of them only Jamal al-Husayni managed to escape to Syria: the remaining five were exiled to the Seychelles. Al-Husseini was not among the indicted but, fearing imprisonment, on 13–14 October, after sliding under cover of darkness down a rope from the Haram's wall, he himself fled via Jaffa to Lebanon, disguised as a Bedouin, where he reconstituted the committee under his leadership. Al-Husseini's tactics, his abuse of power to punish other clans, and the killing of political adversaries he considered 'traitors', alienated many Palestinian Arabs. One local leader, Abu Shair, told Da'ud al-Husayni, an emissary from Damascus who bore a list of people to be assassinated during the uprising "I don’t work for Husayniya ('Husayni-ism') but for wataniya (nationalism)." He remained in Lebanon for two years, under French surveillance in the Christian village of Zouk, but, in October 1939, his deteriorating relationship with the French and Syrian authorities led him to withdraw to the Kingdom of Iraq. By June 1939, after the disintegration of the revolt, Husseini's policy of killing only proven turncoats changed to one of liquidating all suspects, even members of his own family, according to one intelligence report. In 1933, within weeks of Hitler's rise to power in Germany, the German Consul-General in Palestine, Heinrich Wolff, sent a telegram to Berlin reporting al-Husseini's belief that Palestinian Muslims were enthusiastic about the new regime and looked forward to the spread of Fascism throughout the region. Wolff met al-Husseini and many sheikhs again, a month later, at Nabi Musa. They expressed their approval of the anti-Jewish boycott in Germany and asked Wolff not to send any Jews to Palestine. Wolff subsequently wrote in his annual report for that year that the Arabs' political naïvety led them to fail to recognize the link between German Jewish policy and their problems in Palestine, and that their enthusiasm for Nazi Germany was devoid of any real understanding of the phenomenon. The various proposals by Palestinian Arab notables like al-Husseini were rejected consistently over the years out of concern to avoid disrupting Anglo-German relations, in line with Germany's policy of not imperilling their economic and cultural interests in the region by a change in their policy of neutrality, and respect for British interests. Hitler's Englandpolitik essentially precluded significant assistance to Arab leaders. Italy also made the nature of its assistance to the Palestinian contingent on the outcome of its own negotiations with Britain, and cut off aid when it appeared that the British were ready to admit the failure of their pro-Zionist policy in Palestine. Al-Husseini's adversary, Ze'ev Jabotinsky had at the same time cut off Irgun ties with Italy after the passage of antisemitic racial legislation. Though Italy did offer substantial aid, some German assistance also trickled through. After asking the new German Consul-General, Hans Döhle on 21 July 1937 for support, the Abwehr briefly made an exception to its policy and gave some limited aid. But this was aimed to exert pressure on Britain over Czechoslovakia. Promised arms shipments never eventuated. This was not the only diplomatic front on which al-Husseini was active. A month after his visit to Döhle, he met with the American Consul George Wadsworth (August 1937), to whom he professed his belief that America was remote from imperialist ambitions and therefore able to understand that Zionism 'represented a hostile and imperialist aggression directed against an inhabited country’. In a further interview with Wadsworth on 31 August, he expressed his fears that Jewish influence in the United States might persuade the country to side with Zionists. In the same period he courted the French government by expressing a willingness to assist them in the region. With the outbreak of the Second World War in September 1939 the Iraqi Government complied with a British request to break off diplomatic relations with Germany, interned all German nationals, and introduced emergency measures putting Iraq on a virtual war-footing. A circle of 7 officers opposed this decision and the measures taken. With Nuri as-Said's agreement—he wished to persuade al-Husseini of the value of the British White Paper of 1939—they invited al-Husseini to Iraq in October 1939, and he was to play an influential role there in the following two years. A quadrumvirate of four younger generals among the seven, three of whom had served with al-Husseini in World War I, were hostile to the idea of subordinating Iraqi national interests to Britain's war strategy and requirements. In March 1940, the nationalist Rashid Ali replaced Nuri as-Said. Ali made covert contacts with German representatives in the Middle East, though he was not yet an openly pro-Axis supporter, and al-Husseini's personal secretary Kemal Hadad acted as a liaison between the Axis powers and these officers. As the European situation for the Allies deteriorated, Husseini advised Iraq to adhere to the letter to their treaty with Great Britain, and avoid being drawn into the war in order to conserve her energies for the liberation of Arab countries. Were Russia, Japan and Italy to side with Germany however, Iraqis should proclaim a revolt in Palestine. In mid May 1940, despairing of their ability to secure control of Iraq's oil fields and deny access to Germany, the British turned to the extremist Irgun, approaching one of its commanders, David Raziel, whom they had imprisoned in Mandatory Palestine. They asked him if he would undertake to destroy Iraq's oil refineries, and thus turn off the spigots to Germany. Raziel agreed on condition he be allowed to "acquire" (kidnap) the Mufti and bring him back to Palestine. The mission plan was changed at the last moment, however, and Raziel was killed by a bomb dropped from a German plane. Al-Husseini used his influence and ties with the Germans to promote Arab nationalism in Iraq. He was among the key promoters of the pan-Arab Al-Muthanna Club, and supported the coup d'état by Rashid Ali in April 1941. The situation of Iraq's Jews rapidly deteriorated, with extortions and sometimes murders taking place. When the Anglo-Iraqi War broke out, al-Husseini used his influence to issue a fatwa for a holy war against Britain. As the British advanced on the capital, the Farhud pogrom in Baghdad, led by members of the Al-Muthanna Club, which had served as a conduit for German propaganda funding, erupted in June 1941, following the Iraqi defeat and the collapse of Rashid Ali's government. The pogrom was rooted in antisemitic incitement during the preceding decade against the backdrop of the conflict between Arabs and Jews in Palestine. When the war failed for the Iraqis—given its paucity, German and Italian assistance played a negligible role in the war—al-Husseini escaped to Persia (together with Rashid Ali), where he was granted legation asylum first by Japan, and then by Italy. On 8 October, after the occupation of Persia by the Allies and after the new Persian government of Shah Mohammad Reza Pahlavi severed diplomatic relations with the Axis powers, al-Husseini was taken under Italian protection and conveyed through Turkey to Axis Europe in an operation organized by Italian Military Intelligence (Servizio Informazioni Militari, or SIM). 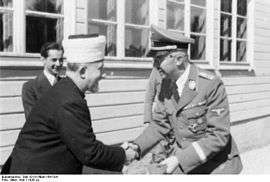 Haj Amin al-Husseini meeting with Adolf Hitler (November 28, 1941). The Mufti was well aware that the European Jews were being wiped out; he never claimed the contrary. Nor, unlike some of his present-day admirers, did he play the ignoble, perverse, and stupid game of Holocaust denial... . His amour-propre would not allow him to justify himself to the Jews... .gloating that the Jews had paid a much higher price than the Germans... he cites... : 'Their losses in the Second World War represent more than thirty percent of the total number of their people ...'. Statements like this, from a man who was well placed to know what the Nazis had done ... constitute a powerful argument against Holocaust deniers. Husseini reports that Reichsführer-SS Heinrich Himmler ... told him in summer 1943 that the Germans had ‘already exterminated more than three million’ Jews: "I was astonished by this figure, as I had known nothing about the matter until then." ... Thus. in 1943, Husseini knew about the genocide... . I ask your Excellency to permit me to draw your attention to the necessity of preventing the Jews from leaving your country for Palestine, and if there are reasons which make their removal necessary, it would be indispensable and infinitely preferable to send them to other countries where they would find themselves under active control, for example, in Poland, thus avoiding danger and preventing damage." It is the duty of Muhammadans in general and Arabs in particular to … drive all Jews from Arab and Muhammadan countries….Germany is also struggling against the common foe who oppressed Arabs and Muhammadans in their different countries. It has very clearly recognized the Jews for what they are and resolved to find a definitive solution [endgültige Lösung] for the Jewish danger that will eliminate the scourge that Jews represent in the world. …. Throughout World War II, al-Husseini worked for the Axis Powers as a broadcaster in propaganda targeting Arab public opinion. 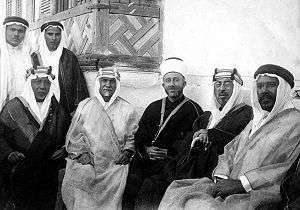 He was thereby joined by other Arabs such as Fawzi al-Qawuqji and Hasan Salama. The Mufti was paid "an absolute fortune" of 50,000 marks a month (when a German field marshal was making 25,000 marks a year), the equivalent today of $12,000,000 a year. Walter Winchell called him "the Arabian Lord Haw-Haw". 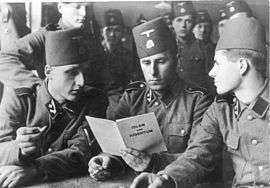 The Mufti also wrote a pamphlet for the 13th SS Handschar division, translated as Islam i Zidovstvo (Islam and Judaism) which closed with a quotation from Bukhari-Muslim by Abu Khurreira that states: "The Day of Judgement will come, when the Muslims will crush the Jews completely: And when every tree behind which a Jew hides will say: 'There is a Jew behind me, Kill him!". Some accounts, ignoring the historical record, have claimed that the Handschar was responsible for killing 90% of Bosnian Jews. In fact, Handschar units were deployed only after most of the Jews in Croatia had been deported or exterminated. One report, however, of a Handschar patrol murdering some Jewish civilians in Zvornik in April 1944 after their real identity was revealed, is plausible. At around this time, the British head of Palestine’s Criminal Investigation Division told an American military attaché that the Mufti might be the only person who could unite the Palestinian Arabs and 'cool off the Zionists'. As early as 24 May, Great Britain requested al-Husseini's extradition, arguing that he was a British citizen who had collaborated with the Nazis. Despite the fact that he was on the list of war criminals, France decided to consider him as a political prisoner and refused to comply with the British request. France refused to extradite him to Yugoslavia where the government wanted to prosecute him for the massacres of Serbs. Poussot believed al-Husseini's claims that the massacre of Serbs had been performed by General Mikhailovitch and not by him. Al-Husseini also explained that 200,000 Muslims and 40,000 Christians had been assassinated by the Serbs and that he had established a division of soldiers only after Bosnian Muslims had asked for his help, and that Germans and Italians had refused to provide any support to them. In the meantime, Zionist representatives—fearing that al-Husseini would escape—backed Yugoslavia's request for extradition. They stated that al-Husseini was also responsible for massacres in Greece and pointed out his action against the Allies in Iraq in 1941; additionally they requested the support of the United States in the matter. The reputation of Haj Amin al-Husseini among Jews in the immediate postwar period is indicated by the observation by Raul Hilberg that when culpability for the destruction of the European Jews was debated in 1945, al-Husseini was the only specific individual singled out to be put on trial. In June, Yishuv leaders decided to eliminate al-Husseini. Although al-Husseini was located by Jewish Army members who began to plan an assassination, the mission was canceled in December by Moshe Sharett or by David Ben-Gurion, probably because they feared turning the Grand Mufti into a martyr. In November 1945, at the initiative of the Arab League, the 'Arab Higher Committee' (AHC) was reestablished as the supreme executive body that represented the Arabs in Mandatory Palestine. This 12-member AHC included Husseini supporters and some members of political parties that opposed the Grand Mufti and his allies. The dispute between Husseini-supporters and their opposition was inflamed by the return of Jamal al Husseini to the Middle East and his resumption of political activity. In March 1946 the AHC was disbanded, and then Jamal reconstituted it as an organization exclusively staffed by Husseini political allies and family-members. The Arab League foreign ministers intervened in June 1948 by replacing both the AHC and the opposing 'Arab Higher Front' with the 'Arab Higher Executive' (AHE) to represent Palestinian Arabs. Haj Amin al Husseini was the Chairman of the AHE, even though he was absent, and Jamal acted as Vice-Chairman. The Husseini faction dominated the nine-member AHE. Subsequently Haj Amin returned to Egypt and began his practical leadership of the Palestinian Arabs while residing in Cairo. The name of the AHE was changed back to AHC in January, 1947. When the United Nations Special Committee on Palestine delivered its recommendations for the partition of Palestine, the High Commissioner of Palestine, Alan Cunningham sent emissaries to Cairo to sound out the Mufti, though transferring any power of state to him was unthinkable. Interviewed on 1 September, he said that the proposed partition was unjust, since it deprived the Arabs of Palestine of what belonged to them, and would not satisfy in any case the Zionists, who desired all of the country. He cited the example of Chaim Weizmann, who opposed the idea of a Jewish state in 1922, approved partition in 1937, and at the Biltmore Conference in 1942, laid claim to the whole of Palestine. It was said of Hitler, he added, that he would never try to apply the ideas he set forth in Mein Kampf. The Zionists, he asserted, would never restrict their programme to a part of Palestine, for l'appétit vient en mangeant(the more you get the more you want). The English would never have ceded a part of their country in exchange for peace with the Nazis. Zionism was a bluff like Italian fascism, which would collapse at the first shock. Musa Alami surmised that the mufti would agree to partition if he were promised that he would rule the future Arab state". According to Issa Khalaf there are no indications to substantiate this claim. On 31 December 1947, Macatee, the American consul general in Jerusalem, reported that terror ruled Palestine, and that partition was the cause of this terror. According to Macatee, the Palestinian Arabs did not dare to oppose Haj Amin, but they did not rally en masse around his flag in the war against the Zionists. The All-Palestine Government was declared in Gaza on 22 September, in a way as a countermeasure against Jordan. According to Moshe Ma'oz this was "a mere tool to justify Cairo’s occupation of the Gaza Strip"  Pre-conference by the Arab League obtained an agreement to have Ahmad Hilmi Pasha preside over the government, while giving al-Husseini a nominal role, devoid of responsibilities. A Palestinian National Council was convened in Gaza on 30 September 1948, under the chairmanship of Amin al-Husseini. On 30 September, al-Husseini was elected unanimously as President, but had no authority outside the areas controlled by Egypt. The council passed a series of resolutions culminating on 1 October 1948 with a declaration of independence over the whole of Palestine, with Jerusalem as its capital. The All-Palestine Government was hence born under the nominal leadership of Amin al-Husseini, the Mufti of Jerusalem, named as its President. Ahmed Hilmi Abd al-Baqi was named Prime Minister. Hilmi's cabinet consisted largely of relatives and followers of Amin al-Husseini, but also included representatives of other factions of the Palestinian ruling class. Jamal al-Husayni became foreign minister, Raja al-Husayni became defense minister, Michael Abcarius was finance minister, and Anwar Nusseibeh was secretary of the cabinet. Twelve ministers in all, living in different Arab countries, headed for Gaza to take up their new positions. The decision to set up the All-Palestine Government made the Arab Higher Committee irrelevant, but Amin al-Husseini continued to exercise an influence on Palestinian affairs. The nakba narratives, according to Hillel Cohen, tend to ignore the open resistance to al-Husseini by many influential Palestinians. A member of the Darwish family on expressing dissent with Husseini's war objective in favour of negotiation was told by the mufti: idha takalam al-seif, uskut ya kalam—'when the sword talks, there is no place for talking'. Many recalled his policy of assassinating mukhtars in the Revolt of 1936–39 and viewed Husseini and his kind as 'an assembly of traitors'. The opposition of a relevant percentage of the Palestinian society to al-Husseini goes back to an earlier period and was also connected to the British way of dealing with the local majority: 'The present administration of Palestine', lamented for example the representatives of the Palestine Arab Delegation in a letter to British public opinion in 1930, 'is appointed by His Majesty’s Government and governs the country through an autocratic system in which the population has no say'. The Palestinian Government was entirely relocated to Cairo in late October 1948 and became a government-in-exile, gradually losing any importance. Having a part in the All-Palestine Government, al-Husseini also remained in exile at Heliopolis in Egypt throughout much of the 1950s. As before 1948, when the Yishuv believed the ex-Mufti's hand could be detected 'behind every anti-Jewish pogrom, murder, and act of sabotage', Israel persisted in asserting that al-Husseini was behind many border raids from Jordanian and Egyptian-held territory, and Egypt expressed a readiness to deport him if evidence were forthcoming to substantiate the charges. The All-Palestine Government was eventually dissolved in 1959 by Nasser himself, who envisaged a United Arab Republic embracing Syria, Egypt and Palestine. That year he moved to Lebanon. He refused requests to lend his support to the emergent PLO after the Six Day War of 1967, was opposed to the creation of a Palestinian state on the west Bank after 1967. and his closest collaborator, Emil Ghuri, continued to work for the Jordanian monarchy even after the Jordanian Civil War there in 1970. Al-Husseini's first biographer, Moshe Pearlman, described him as virulently antisemitic, as did, a decade and a half later, Joseph Schechtman. There is no doubt Husseini became robustly judeophobic and convinced himself, using arguments based on Biblical, Talmudic, and Quranic passages, that Jews were enemies of God, engaged in a global conspiracy, and practicing the ritual use of Christian blood. More recent biographers like Philip Mattar and Elpeleg, writing in the late 1980s and early 1990s, began to emphasize his nationalism. While the Palestinian historian Mattar blames him as the main culprit for sowing the seeds of the Arab–Israeli conflict, Elpeleg compares him to Chaim Weizmann, David Ben-Gurion, and even to Theodor Herzl. Peter Wien judges that his behaviour in World War II deserved the image among Zionists of him as an 'arch villain', but adds that Israeli and Zionist leaders have long since used this to denigrate the Palestinian resistance against the Israeli occupation as inspired by Nazism from the beginning and thus fundamentally anti-semitic. '[i]n any case, there is no doubt that Haj Amin's hatred was not limited to Zionism, but extended to Jews as such. His frequent, close contacts with leaders of the Nazi regime cannot have left Haj Amin any doubt as to the fate which awaited Jews whose emigration was prevented by his efforts. His many comments show that he was not only delighted that Jews were prevented from emigrating to Palestine, but was very pleased by the Nazis' Final Solution'. Walter Laqueur, Benny Morris, Klaus-Michael Mallmann and Martin Cüppers, the evidential basis for whose claims in their book, translated as "Nazi Palestine" were questioned by Michael Sells as based on selective statements by a few writers taken at face value, share the view that al-Husseini was biased against Jews, not just against Zionists. Morris, for instance, notes that al-Husseini saw the Holocaust as German revenge for a putative Jewish sabotaging of their war effort in World War I, and has written that "Haj Amin al-Husseini was an antisemite. This is clear from his writings. I am not saying he was just an anti-Zionist, he hated the Jews, 'Jews were evil'". In a study dedicated to the role and use of the Holocaust in Israeli nationalist discourse, Idith Zertal reexamining al-Husseini's antisemitism, states that 'in more correct proportions, [he should be pictured] as a fanatic nationalist-religious Palestinian leader'. Philip Mattar suggests that in 1939 al-Husseini should have accepted the favorable White Paper of 1939, or compromise with the Zionists. But the Mufti adapted a strategy of active and futile opposition and rejection, which contributed to the ultimate defeat of the Palestinians. In the testimony of Fritz Grobba confirm that an associate of al-Husseini's together with three associates of the former Iraqi Prime Minister certainly did visit the Sachsenhausen concentration camp as part of a German secret police "training course" in July 1942. At the time, the Sachsenhausen camp housed large numbers of Jews, but was only transformed into a death camp in the following year. Their tour through the camp presented it as a re-educational institution, and they were shown the high quality of objects made by inmates, and happy Russian prisoners who, reformed to fight Bolshevism, were paraded, singing, in sprightly new uniforms. They left the camp very favourably impressed by its programme of educational indoctrination. The official German transcript of the meeting with Hitler contains no support for Netanyahu's assertion. In his memoirs, he recalls Himmler telling him how shocked he was to observe Jewish kapos abusing fellow Jews and that Himmler claimed he had the culprits punished. "One must note in passing that Amin al-Husseini's memoirs are an antidote against Holocaust denial: He knew that the genocide took place and boasted of having been perfectly aware of it from 1943 on. I believe he is an architect of the Nakba (the defeat of 1948 and the departure of hundreds of thousands of Palestinians who had been driven out of their lands) in the sense that he bears a share of responsibility for what has happened to the Palestinian people." ↑ Mattar 1998, p. 156. Mattar, writing on the uncertainty of al-Husseini's birthdate, notes that he wrote both 1895 and 1896 on official documents between 1921 and 1934, which Mattar suggests was due to both years corresponding to 1313 A.H. in the Islamic calendar. Mattar found no documentary evidence for Husseini's claim, written later in life, that he was born in 1897. ↑ Laurens 2002, p. 624, n.5. Laurens argues that 1897 was his likely date of birth, suggesting he was induced by circumstances to assert that he was older when giving various dates for his birth, ranging from 1893 to 1897. ↑ Elpeleg 2007, p. 1. ↑ Elpeleg & 2007 pp6-7. ↑ Khalidi 2001, p. 23: "There is an element of amnesiac historiography in the vilification of the mufti, influenced by his subsequent career after 1936. In fact, Husayni served the British exceedingly well for the decade and a half after his appointment, at least until 1936 when he felt obliged to align himself with a growing popular rebellion against his former British masters. One indication of how valuable the British perceived the mufti to be is the willingness of the notoriously tight-fisted Mandatory administration to subsidize him. When the revenues of the public awqaf properties declined after the Great Depression of 1929, and with it the revenues of the Supreme Muslim Council, the latter were supplemented by British subventions starting in 1931, which were naturally kept secret.". ↑ Gelvin, James L. (13 January 2014). The Israel-Palestine Conflict: One Hundred Years of War. Cambridge University Press. pp. 119–120. ISBN 978-1-107-47077-4. The Hajj Amin’s opportunistic wartime residence and propaganda activities in Nazi Germany certainly was not the proudest moment in the history of Palestinian nationalism. And, certainly, opponents of Palestinian nationalism have made good use of those activities to associate the Palestinian national movement with European-style anti-Semitism and the genocidal program of the Nazis. But it should be remembered that the Hajj Amin was not the only non-European nationalist leader to find refuge and succor in Berlin at this time. While in Berlin, the Hajj might have rubbed shoulders with Subhas Chandra Bose, a leader of the nationalist Congress Party of India, who believed that Germany might prove to be an effective ally in the struggle against British imperialism… Or the Hajj Amin might have bumped into Pierre Gemayel, the leader of a Lebanese Christian group called the Phalange, who believed that Nazi Germany represented the wave of the future… Members of the Stern Gang also sought a tactical partnership with Nazi Germany and even opened negotiations with Hitler’s government. ↑ Mattar 1998, p. 156;Laurens 2002, p. 624,n.5 Laurens, in the first volume of his trilogy (Laurens 1999, p. 425) had used Mattar's dating for 1895, but revised this to 1897 as more probable in his second volume. ↑ Mattar 1992, p. 6;Pappé 1994, p. 2. ↑ Laurens 1999, p. 425. 1 2 Krämer 2008, p. 219. 1 2 3 Matthews 2006, p. 31. ↑ Elpeleg 2007, p. 3. ↑ Krämer 2008, pp. 152–153:Both local Palestinian Arabs and Jews played almost no role in the conquest of Palestine: the former enlisted after the Arab revolt and were active east of the Jordan, the latter were recruited after the conquest of Jerusalem and saw little military action. ↑ Huneidi 2001, p. 35. ↑ Friedman 2000, pp. 239–240. ↑ Tauber 1994, pp. 79ff., esp.96ff..
↑ Huneidi 2001, p. 40. The report was never published, the newly appointed High Commissioner Sir Herbert Samuel informing the War Office that it was best forgotten. ↑ Schechtman 1986, pp. 334–337. ↑ Elpeleg 2007, p. 6. ↑ Sicker 2000, pp. 23ff. for a reading which follows closely Meinertzhagen's reading of the events as a British army plot. ↑ Regarding the whole period preceding the riot, marked by conflicting rumours, Laurens writes:'For several months, the intelligence service Zionists organised in 1918 multiplied warnings about plots by Arab activists. These pieces of information never received any confirmation from the British (or French) intelligence service. Later Arab sources show this quite clearly: no one claimed responsibility for any planning (prémeditation) for the events, even several decades afterwards'. Laurens 1999, p. 506. ↑ Tauber 1994, p. 102. ↑ Huneidi 2001, p. 37 citing the Palin Report, pp. 29-33. ↑ Tauber 1994, pp. 105–109. ↑ Ghandour 2009, p. 142. ↑ Morris 2011, pp. 111ff. ↑ Elpeleg 2007, pp. 7–10. ↑ Kupferschmidt 1987, pp. 19,78:'Soon after the British began to style Kāmil al-Husaynī as the Grand Muftī (al-muftī al-akbar), a title which had hitherto been unknown in Palestine but which was probably copied from Egypt.This gesture was, in part, meant as a reward for Kāmil’s cooperation with the British, but it may have been intended to substitute some kind of a new hierarchy for the former Ottoman one'. 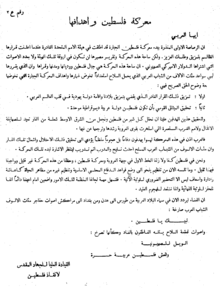 ↑ Elpeleg 2007, p. 11:'He demanded that the title Grand Mufti, which had been granted to his brother by the British for cooperating with them, also be given to him, and that his salary be higher than that of the other muftis. Richmond and Storrs supported this claim, arguing that since, from the spiritual and religious points of view, the status of Jerusalem was superior to that of other regions in Palestine, the Mufti of Jerusalem should be considered head of the country's Muslim community. '. ↑ Khalidi 2001, p. 22:'After their occupation of the country, the British created the entirely new post of "grand mufti of Palestine" (al-mufti al-akbar), who was also designated the "mufti of Jerusalem and the Palestine region" (mufti al-Quds wal-diyar al-filistiniyya). ↑ Cohen 1989, p. 69. ↑ Sicker 2000, pp. 32f. :Elpeleg 2007, p. 48. ↑ Reiter 1996, pp. 22–24 for details. ↑ Huneidi 2001, p. 38 This excludes funds for land purchases. The 'Jewish Agency', mentioned in article 4 of the Mandate only became the official term in 1928. At the time the organisation was called the Palestine Zionist Executive. ↑ Robinson 1997, p. 6. ↑ Kupferschmidt 1987, pp. 131–132 for a detailed list of the several sites on the Haram that underwent extensive renovation. ↑ Monk 2002, p. 61 The name is occasionally given as Kamal Bey, or Kamal al-Din in primary and secondary sources. ↑ Monk 2002, pp. 42–72 for a detailed account of Richmond's role. Richmond authored an important volume on the Haram (Ernest Tatham Richmond, The Dome of the Rock in Jerusalem: A description of its structure and decoration, Oxford University Press, Oxford 1924). ↑ Kupferschmidt 1987, pp. 127ff.,130. The mosaic tesserae, however, were manufactured in, and imported from, Turkey. ↑ Sicker 2000, p. 77. ↑ Benvenisti 1996, pp. 77f. writes that Rabbi Kook had preached as early as 1920:'The Temple Mount is Israel’s holy place, and even should it be under the hand of others for long days and periods of time, it will finally come into our hands. . ,' which could merely mean however that, in rabbinical thought, with the coming of the Messiah, the Temple would automatically revert to the Jews. ↑ Yaeger 1996, pp. 196ff..
↑ The longest accounts for the riots are in Kolinksy 1993, pp. 42–70 and Segev 2001, pp. 309–327. ↑ Kupferschmidt 1987, p. 131 gives the 26th: Laurens 2002, p. 155 (translation needed) gives the 17th. ↑ Laurens 2002, p. 157: Kupferschmidt 1987, p. 131 gives 24 September. ↑ Lajnat al-Difa and al-Buraq al-Sharif. See Monk 2002, p. 70. The Muslim name for the contested section of the wall, where Mohammed was said to have tethered his steed Buraq while on his famous visionary flight to heaven. See Krämer 2008, p. 225. ↑ Laurens 2002, p. 632. n.3: 'Fixed hours of Jewish worship' was given, instead of 'customary hours of Jewish worship'. ↑ Sicker 2000, p. 79:'This was done to ensure a new major influx of non-Zionist American wealth into the country to support the development of a Jewish national home'. ↑ Sicker 2000, pp. 179ff..
↑ Laqueur 2002, pp. 168–169. ↑ Krämer 2008, p. 230. ↑ Krämer 2008, p. 230 writes that it was in revenge for the former incident. ↑ Laurens 2002, p. 171 asserts that 'The matter was sufficiently important. . for this not to be (read as) an attempt to secure an alibi for subsequent events'. ↑ Laurens 2002, p. 179 translation needed; Sicker 2000, p. 46 gives 133 Jewish killed, and 339 wounded, 116 Arabs known to be killed, and 232 known to be wounded, the latter almost entirely due to police actions. The Arab wounded are those registered by the Mandatory authorities. Many preferred to hide their injuries. 1 2 Great Britain 1930, p. 172. ↑ Permanent Mandates Commission 1930. ↑ Huneidi 2001, p. 36 citing Palin Report p. 184. ↑ Sells 2015, p. 725. ↑ Laurens 2002, pp. 175–176. ↑ Hen-Tov 1974, p. 16. ↑ Lachman 1982, pp. 75–76. ↑ Achcar 2010 (a), p. 144. ↑ Rosen 2005, p. 104. Rosen notes that, by 1934, it had 63 cells (400 youths). ↑ Laurens 2002, pp. 292, 297f. One such discovery, in the port of Haifa, in October 1935, of a shipment of arms from Germany, with the apparent authorization of the Nazi Ministry for Internal Affairs, and destined for the Haganah, led to great agitation and played into the hands of those Arabs who pressed for more radical activities. translation needed. ↑ Laurens 2002, p. 376. ↑ De Felice 1990, pp. 210–211 mentions £138,000 from 10 September 1936 to 15 June 1938. Earlier, in January 1936 Italy had given al-Husseini £12,000 of a promised £25,000. ↑ De Felice 1990, pp. 210. ↑ Sachar 2006, pp. 199–200. ↑ Sachar 1972, p. 73. 1 2 Sachar 2006, pp. 200–201. ↑ Laurens 2002, p. 373:Levenberg 1993, p. 8 provides the text of the decree. ↑ Rose 1986, p. 332. ↑ Mattar 1988, p. 83. ↑ Fieldhouse 2006, p. 169. ↑ Karmi 2004, p. 9 Ghada Karmi recalls that her eldest uncle, who refused to join Husseini's camp, suffered two attempts on his life by an assassin sent by al-Husseini, in Nablus and Beirut. The second attempt succeeded. ↑ Swedenburg 2003, p. 87. ↑ Laurens 2002, p. 374. ↑ Cohen 2009, p. 171. ↑ Hilberg 1973, p. 716. ↑ Khalaf 1991, pp. 72–75. ↑ Aboul-Enein & Aboul-Enein 2013, pp. 184–186. ↑ De Felice 1990, pp. 212–213:'It should be quite clear that this relation (arose) not, as a number of authors have nonetheless argued, because of a presumed affinity of their ideology with that of the Nazis or Fascists, no such thing existed, but by virtue of the wholly political logic (of events) that saw in the enemies (in deed or potentially) of their own enemies their own friends, particularly if the latter have already provided evidence—and this was, precisely, the case with Germany, and all the more so, with Italy -of being interested, in terms of the same political logic, in giving support to their cause'. ('E questo, sia ben chiaro, non -come pure è stato sostenuto da vari autori - per una presunta affinità della loro ideologia con quelle nazista e fascista, che non esisteva, ma in forza della logica tutta politica che vede nei nemici (in atto o potenziali) dei propri nemici i propri amici, specie se essi hanno già dato prova - e questo era appunto il caso della Germania ed ancor più dell'Italia - di essere interessati, nella stessa logica politica, a sostenere la loro causa'). ↑ Laqueur 1970, p. 106. ↑ Nicosia 2000, pp. 87 Wolff's wife was Jewish, and he was forced to resign in 1936. Hans Döhle replaced him. ↑ Nicosia 2000, pp. 85–86. ↑ Nicosia 2000, pp. 86–87. ↑ De Felice 1990, pp. 211–212. ↑ Nicosia 2000, pp. 105,185ff. ↑ Hirszowicz 1966, pp. 82–83. ↑ Mattar 1984, p. ? ; Nevo 1984, pp. 3–16;Simon 2004, p. 207, n.16. 1 2 Gavish 2010, p. 239. ↑ Davis 2005, p. 70. ↑ Lukitz 1995, p. 96. ↑ De Felice 1990, p. 247. ↑ Lewis 1999, pp. 150–151. ↑ Lewis 1999, pp. 151–152. ↑ Segev 2001, p. 463. ↑ Lewis 1999, p. 152. ↑ Lewis 2002, p. 190. ↑ Browning 2004, p. 406 drawing on Yisraeli 1974, p. 310. ↑ Yisraeli 1974, p. 310:denn die Stunde der Befreieung der Araber habe dann geschlagen, Deutschland habe dort keine anderen Interessen als die Vernichtung der das Judentum protegierenden Macht. ↑ Laurens 2002, p. 468. ↑ Günther & Zankel 2006, p. 7. ↑ Sells 2015, pp. 734–735. ↑ Kaufman, Ambiguous Partnership, 287, 306–7. Steven L Spiegel, The Other Arab–Israeli Conflict (Chicago: 1985), 17, 32, quoted in Norman G. Finkelstein (17 October 2003). The Holocaust Industry: Reflections on the Exploitation of Jewish Suffering. Verso Books. p. 25. ISBN 978-1-78168-440-5. ↑ Schwanitz 2008 citing Abd al-Karim al-Umar (ed. ), Memoirs of the Grand Mufti, Damascus, 1999, p. 126. ↑ Achcar 2010 (a), pp. 151–2. ↑ Laurens 2002, p. 469. ↑ Schwanitz 2008, p. ? citing Abd al-Karim al-Umar (ed. ), Memoirs of the Grand Mufti, Damascus, 1999, p. 126. 1 2 Achcar 2010 (a). ↑ Ahren 2015' Yehuda Bauer, Israel’s preeminent Holocaust scholar, is a prominent case in point. "After the war, they caught him (Wisliceny) and tried him at Nuremberg, where he tried to eschew all responsibility, saying: ‘It wasn’t Hitler, it wasn’t me, it was the mufti,' . . It’s clear that his account is untrue: the Germans had started annihilating the Jews half a year before Hitler and the mufti met." ↑ Cesarani 2007, p. 263. ↑ 'It is doubtful whether Eichmann made contact with al-Husseini even in 1942, when the latter resided in Berlin. If this fallen idol makes an occasional appearance in Eichmann's office correspondence it is because Eichmann's superiors at the Foreign Office found the Mufti a very useful sacred cow, always to be invoked when the reception of Jewish refugees in Palestine was under discussion. Dieter Wisliceny even believed that Eichmann regarded al-Husseini as a colleague in a much expanded post-war Final Solution. 'Reitlinger 1971, pp. 27–28. ↑ Sells 2015, p. 738. ↑ Pearlman 1963, p. 596. ↑ Arendt 1965, p. 13. 1 2 3 Medoff 1996, p. ? ↑ Lewis 1999, p. 156. ↑ Hilberg 1973, p. 504. ↑ Zertal 2005, p. 102. ↑ Schechtman 1965, pp. 154–155. ↑ Achcar 2010 (a), p. 148. ↑ Achcar 2010 (a), pp. 145–146. ↑ Carpi 1977, p. 39. ↑ Elpeleg 2007, p. 68. 1 2 New Documents 2001, p. 19. 1 2 Mallmann & Cüppers 2010, p. 201. ↑ Bar-Zohar & Haber 2002, pp. 45–66. ↑ Finkelstein 2005, p. 322. ↑ Sells 2015, p. 747 n.33. ↑ Stillman 2000, p. 143. ↑ Fisk 2006, p. 439. ↑ Hoare, Marko Attila (2013). The Bosnian Muslims in the Second World War: A History. London: C. Hust and Co. p. 53. ISBN 978-1-84904-241-3. ↑ Stein 1984, pp. 184–5. ↑ Lepre 1997, p. 228, n.28. ↑ Lepre 1997, p. 47 named from the word for a Turkish policeman's sword (or fighting knife:handžar from Turkish hancerTomasevich 2001, p. 497), which had figured as an emblem on the Bosnian coat-of-arms. ↑ Lepre 1997, p. 34. ↑ Lepre 1997, p. 313. ↑ Lepre 1997, p. 33. ↑ Lepre 1997, p. 125. ↑ Lepre 1997, p. 135. ↑ Hoare 2014, pp. 194–195. ↑ Lepre 1997, pp. 247ff..
↑ Lepre 1997, p. 303. 1 2 Fisk 2006, p. 446. 1 2 3 4 5 6 7 8 9 10 11 12 13 14 Hershco 2006. ↑ Breitman & Goda 2011, p. 21. ↑ Shlaim 2000, pp. 156–7 regarding Ben-Gurion's relationship with al-Husseini writes of '(his) old tactic of projecting an image of reasonableness and placing the onus for the deadlock on the shoulders of his Arab opponents. This was the tactic that had served him so well in relation to the grand Mufti, Hajj Amin al-Husseini, and other Arab leaders in the pre-Independence period'. 1 2 Laurens 2002, p. 549. ↑ Laurens 2002, pp. 594–5. ↑ Radosh & Radosh 2008, pp. 65–75. ↑ Shlaim 2001, p. 30. ↑ Elpeleg 2007, p. 106. 1 2 Levenberg 1993, p. 198. ↑ Sayigh 2000, p. 14. ↑ Musa Budeiri. "The Battle for Jerusalem in the Memoirs of Anwar Nusseibeh". Jerusalem Quarterly File, 11-12, 2001. ↑ Shlaim 2001, p. 97. ↑ Kassim 1988, p. 294. ↑ Shlaim 2001, p. 99. ↑ Laurens 2007, pp. 167–169. ↑ Brynen 1990, p. 20. ↑ Cohen 2008, p. 237. ↑ Elpeleg 2007, p. 48. ↑ Elpeleg 2007, p. 98. ↑ Laurens 2007, p. 308. ↑ Laurens 2007, p. 694. 1 2 Achcar 2010 (b), p. 162. ↑ Fisk 2006, p. 447. ↑ Achcar 2010 (b), pp. 162–163. ↑ Schechtman 1965, p. ?. ↑ Mattar 1992, p. 13. ↑ Kiely 2008, p. 113. ↑ Elpeleg 2007, p. 73. ↑ Laqueur & Rubin 2001, p. 51. ↑ Morris 2008, pp. 21–22, "He was deeply anti-Semitic. He later explained the Holocaust as owing to the Jew's sabotage of the German war effort in World War I and the millennia of Gentile anti-Semitism as due to the Jews' 'chararacter': (quoting al-Husseini) 'One of the most prominent facets of the Jewish character is their exaggerated conceit and selfishness, rooted in their belief that they are the chosen people of God. There is no limit to their covetousness and they prevent others from enjoying the Good. … They have no pity and are known for their hatred, rivalry and hardness, as Allah described them in the Qur'an.' "
↑ Zertal 2005, pp. 102, 175:'the demonization of the Mufti serves to magnify the Arafatian threat', … the '[portrayal of the Mufti as] one of the initiators of the systematic extermination of European Jewry (…) has no (…) historical substantiation'. (p.175). ↑ Fisk 2006, p. 441. ↑ Zertal 2005, pp. 102–3. ↑ Browning 2015: "His extraordinary exaggeration of Husseini’s complicity, and by implication that of the entire Palestinian people, is a blatant attempt to stigmatize and delegitimize any sympathy or concern for Palestinian rights and statehood. Netanyahu's shameful and indecent speech is a disservice to anyone — Jew and non-Jew — for whom research, teaching, and preservation of the historical truth of the Holocaust has value, meaning, and purpose." ↑ Gensicke 2011, p. 119, he wrote on 17 July 1942 that the Mufti himself had visited Oranienburg concentration camp and that "the Jews aroused particular interest among the Arabs. ... It all made a very favorable impression on the Arabs." ↑ Lebor & Boyes 2000, p. 230. ↑ Schwanitz 2004, pp. 217–220. ↑ Sells 2015, p. 726. ↑ Sells 2015, p. 736. ↑ Höpp 2004, pp. 217–221. ↑ Sells & 2015 pp.749-759,p.749, note 35. Breitman, Richard; Goda, Norman J. W. (2010). Hitler's Shadow:Nazi War Criminals, U.S.Intelligence, and the Cold War (PDF). National Archives and Records Administration. Browning, Christopher (22 October 2015). "Bibi's self-serving, Palestinian-blaming version of Nazi history is just plain wrong.". Foreign Policy. Carpi, Daniel (1977). "The Rescue of Jews in the Italian Zone of Occupied Croatia". In Gutman, Yisrael; Zuroff, Ephraim. Rescue Attempts During the Holocaust: Proceedings of the Second Yad Vashem International Historical Conference, April 1974 (PDF). Jerusalem: Yad Vashem. Elpeleg, Zvi (2007) . Himmelstein, Shmuel, ed. The Grand Mufti: Haj Amin Al-Hussaini, Founder of the Palestinian National Movement. (trans. David Harvey). Routledge. ISBN 978-0-714-63432-6. Gonen, Rivka (2003). Contested holiness: Jewish, Muslim, and Christian perspectives on the Temple Mount in Jerusalem. Publishing House, Inc.,. ISBN 978-0-88125-798-4. Günther, Niklas; Zankel, Sönke (2006). Günther, Niklas; Zankel, Sönke, eds. Abrahams Enkel Juden, Christen, Muslime und die Schoa. Franz Steiner Verlag. ISBN 978-3-515-08979-1. Hōpp, Gerhard (2004). "In the Shadow of the Moon". In Schwanitz, Wolfgang G. Germany and the Middle East 1871–1945. Princeton: Markus Wiener. pp. 217–221. ISBN 978-1-558-76298-5. Hōpp, Gerhard; Wien, Peter (2010). "The Suppressed Discourse:Arab Victims of National Socialism". In Liebau, Heike; Bromber, Katrin; Lange, Katharina; Hamzah, Dyala; Ahuja, Ravi. The World in World Wars: Experiences, Perceptions and Perspectives from Africa and Asia. Brill. pp. 167–216. ISBN 978-9-004-18545-6. Hopwood, Derek (1980). "Amin al-Husayni". In Bosworth, Clifford Edmund. The Encyclopaedia of Islam, New Edition: Supplement, Parts 1-2. Leiden: Brill Archive. pp. 67–70. ISBN 978-9-004-06167-5.
al-Husayni, Haj Amin (1999). Abd al-Karim al-Umar, ed. Memoirs of the Grand Mufti. Damascus. Jbara, Taysir (1985). Palestinian Leader, Hajj Amin Al-Husayni, Mufti of Jerusalem. Kingston Press Series. ISBN 0-940670-21-6. Kamel, Lorenzo (2013). "Hajj Amīn al-Ḥusaynī, the "creation" of a leader". Storicamente. 9. doi:10.12977/stor490. Kassim, Anis F. (1 June 1988). Palestine Yearbook of International Law 1987-1988. 4. Kluwer Law International. ISBN 90-411-0341-4. Khalidi, Rashid (1997). "The Formation of Palestinian Identity: The Critical Years, 1917-1923". In Jankowski, James; Gershoni, Israel. Rethinking Nationalism in the Arab Middle East. Columbia University Press. pp. 171–189. ISBN 978-0-231-10695-5. Khalidi, Rashid (2001). "The Palestinians and 1948: the underlying causes of failure". In Eugene L., Rogan; Shlaim, Avi. The war for Palestine: rewriting the history of 1948. Cambridge University Press. pp. 12–36. ISBN 978-0-521-79476-3. Kiely, Robert S. (2008). "Anti-Semitism". In Tucker, Spencer C. The Encyclopedia of the Arab-Israeli Conflict: A Political, Social, and Military History. ABC-CLIO. pp. 110–114. ISBN 978-1-851-09842-2. Kohn, Hans (1929). A History of Nationalism in the East. Taylor & Francis. Lachman, Shai (1982). "Arab Rebellion and Terrorism in Palestine 1929-1939". In Kedourie, Elie; Haim, Sylvie G. Zionism and Arabism in Palestine and Israel. Frank Cass. ISBN 978-0-714-63169-1. Lepre, George (1997). Himmler's Bosnian Division; The Waffen-SS Handschar Division 1943-1945. Schiffer Military History. ISBN 978-0-7643-0134-6. Mallmann, Klaus Michael; Cüppers, Martin (2006). Matthäus, Jürgen; Mallmann, Klaus-Michael, eds. Deutsche - Juden - Völkermord. Der Holocaust als Geschichte und Gegenwart (Germans, Jews, Genocide — The Holocaust as History and Present). Darmstadt: Wissenschaftliche Buchgesellschaft. ISBN 978-3-534-18481-1. Mallmann, Klaus Michael; Cüppers, Martin (2010). Matthäus, Jürgen; Mallmann, Klaus-Michael, eds. Nazi Palestine: The Plans for the Extermination of the Jews in Palestine. Enigma Books. ISBN 978-1-936-27418-5. Mattar, Philip (1998) . The Mufti of Jerusalem: Al-Hajj Amin al-Husayni and the Palestinian National Movement. Columbia University Press. ISBN 978-0-231-06463-7. Medoff,, Rafael (1996). 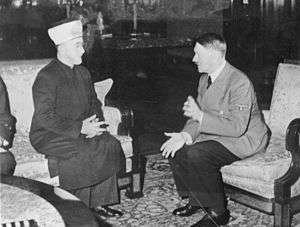 "'The Mufti's Nazi Years Re-examined". The Journal of Israeli History. 17. pp. 317–333. doi:10.1080/13531049608576090. Mikics, David (3 February 2014). "Did Zionism Cause the Holocaust? A New Biography Says Yes.". Tablet Magazine. Mousavizadeh, Nader (1996). The Black Book of Bosnia :the consequences of appeasement. Basic Books. ISBN 978-0-465-09835-4. Nevo, Joseph (1984). "Al-Hajj Amin and the British in World War II". 20 (1). Middle Eastern Studies: 3–16. "New Document Releases MI5 Files" (PDF). nationalarchives.gov.uk. London: National Archives. July 2001. Archived (PDF) from the original on 1 April 2014. Retrieved 1 April 2014. Permanent Mandates Commission (21 June 1930). Minutes of the Seventeenth (Extraordinary) Session. League of Nations. Rudoren, Jodi (21 October 2015). "Netanyahu Draws Broad Criticism After Saying a Palestinian Inspired Holocaust". New York Times. Sachar, Howard Morley (1972). Europe leaves the Middle East, 1936-1954. Knopf,. ISBN 978-0-394-46064-2. Samuel, Edwin (1970). A Lifetime in Jerusalem: The Memoirs of the Second Viscount Samuel. Abelard-Schuman,Israel University Press. ISBN 978-0-87855-181-1. Schwanitz, Wolfgang G. (2004). Germany and the Middle East, 1871-1945. Markus Wiener,. ISBN 978-1-558-76298-5. Sells, Michael A. (2015). "Holocaust Abuse: The Case of Hajj Muhammad Amin al-Husayni". 43 (4). Journal of Religious Ethics: 723–759. Shlaim, Avi (2001). "Israel and the Arab Coalition". In Rogan, Eugene; Shlaim, Avi. The War for Palestine:rewriting the history of 1948. Cambridge University Press. pp. 79–103. ISBN 978-0-521-69934-1. Stillman, Norman (2000). "Frenchman, Jews, or Arabs? Jews of the Arab World between European Colonialism, Zionism, and Arab Nationalism". In Hary, Benjamin H.; Hayeseds, John Lewis; Astren, Fred. Judaism and Islam: Boundaries, Communications, and Interaction: Essays in Honor of William M. Brinner. Brill. pp. 123–138. ISBN 978-90-04-11914-7. Tschirgi, Dan (2004). "Palestine 2003:the perils of de facto statehood". In Bahcheli, Tozun; Bartmann, Barry; Srebnik, Henry. The Quest for Sovereignty. Routledge. pp. 123–138. ISBN 978-1-135-77121-8. Zankel, Sönke (2006). "Der Jude als Anti-Muslim: Amin al-Husseini under "der Judenfrage"". In Günther, Niklas; Zankel, Sönke. Abrahams Enkel Juden, Christen, Muslime und die Schoa. Franz Steiner Verlag. pp. 41–51. ISBN 978-3-515-08979-1.